In the later months of 1913, two citizens of Akron independently conceived the idea that Akron should have a Rotary Club. Architect M.E. Harpster had been a guest at a Cleveland Rotary meeting and Harry A. Bauman, an executive with the B.F. Goodrich Co., had attended several meetings at the Toledo Rotary. Each gentleman enthusiastically talked of Rotary with friends and was determined to start a club entirely without the knowledge that the other had the same idea. They both contacted the International Secretary of Rotary in Chicago and were advised to get together and merge their respective endeavors. Mr. Bauman was quoted, "We met with considerable skepticism. 'Akron won't stand for such a club' was quite the common talk. But we put into practice that slogan- Fools Don't Know What Can't Be Done, and we went ahead and did it." In the early days of Akron Rotary, regular luncheon meetings were held once a week, with one meeting a month set aside for "getting acquainted." This special meeting was generally held in the evening and occasionally wives of Rotarians joined their husbands for dinner and dancing. 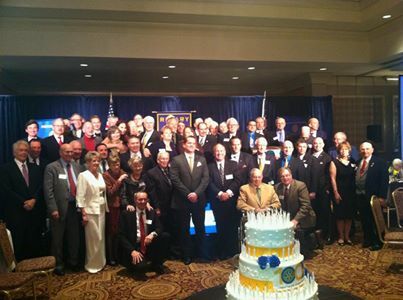 It was from this informal beginning that a very strong "right-arm" of Akron Rotary was born. This "right arm" was called the Rotary Anns, whose aims and ideals paralleled that of Rotary as each group gave strength to the other. Seventy-three years later, in September of 1987, the club invited two professional women, Deborah Sesek and Pamela Kiltau, to become members. Today Akron Rotary boasts that business professional women and men are bound through the mutual philosophy of fellowship through service to others. Rotary was founded as a service organization with the mottoes "Service Above Self" and "He Profits Most Who-Serves Best." From its very inception, Akron Rotary has vested its humanitarian and service interests in youth and handicapped children.